One of my fantasy hairstyles is to one day have the perfect neck length bob. It's flattering, chic, modern, and feminine. The reason why I haven't quite taken the plunge is because I had this limiting belief that a neck length is pretty boring with few styling options. The other day I stumbled on an Instagram page of a young lady who completely challenged my incorrect notion about short hair. Although she's a makeup artist who predominantly posts beauty looks, the first thing that stood out to me was how gorgeous her hair was. More importantly, she demonstrated the versatility of shorter length hair. The beauty I'm referring to is Tamia Styles and her Instagram is loaded with creative looks that will keep you inspired. 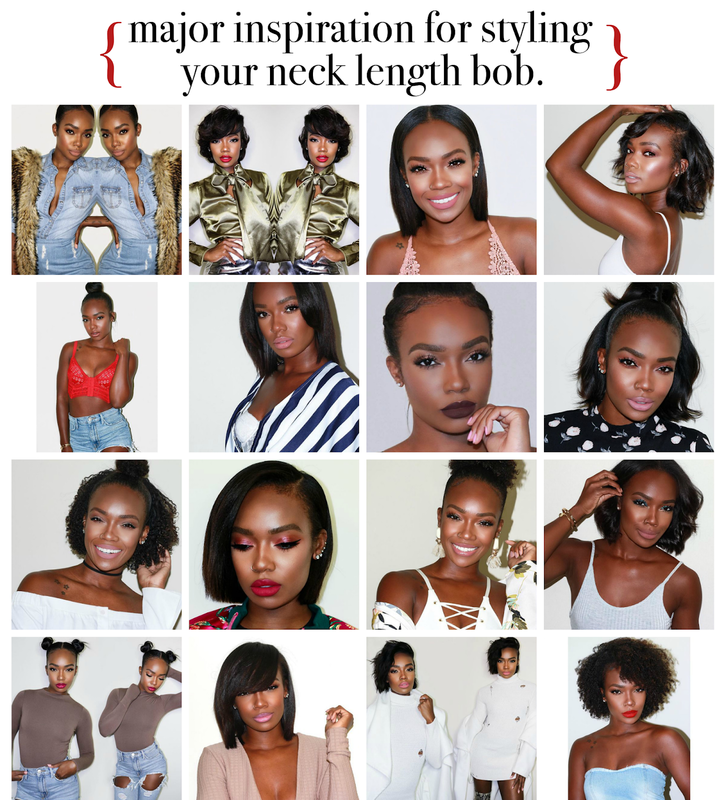 Heck, even if you have longer, or shorter tresses, you can experiment with many of these same looks. In my opinion, what makes her styling exceptional are the healthy blunt cut ends and the health of her individual strands. Although she uses heat regularly, her hair remains thick and healthy. Her blunt ends remind me that perhaps I should really consider trimming for summer. Tamia's hair offers the great reminder that healthy hair always trumps length. Although she's a regular user of heat, Tamia is still retaining length month after month. Just six short months ago, she posted a video of her hair that appeared to be around chin length. Now, her bob reaches her shoulders. I'm not familiar with her entire hair regimen but I suspect the blunt cut helps her retain length despite the constant use of heat. Rarely do my ends break when they're well trimmed. Even with high manipulation, they still manage to persevere. I'm sure this has to do with the "strength in numbers" theory I spoke about years ago. The roundup of images I shared are just a few of her many styling options. If you want to check out her entire feed, be sure to visit Tamia's Instagram or you can watch her hair in action, while checking out her beautiful makeup looks via her Youtube. Thanks for posting this. I just had my hair cut to neck length due to massive shedding and damage. This is great inspiration!